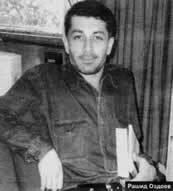 Ozdoev Rashid Borisovich, 1975. kidnapped in March, 11, 2004. FSB and international relations supervision senior assistant procurator of Ingushetiya. Rashid Ozdoev was kidnapped in March,11,in the evening,in Verkhny Achaluki outskirts(by private investigation data). His auto was rammed with auto «Niva»,green color with darkened glasses.It was accompanied with another car «Gazel» with Stavropol licence number plates (26th region).At once after clashing,armed and camouflaged men jumped out of «Gazel» – they are called «tyazholy» in Ingushetiya (they are troopers of RF ministry of internal affairs mobile platoon or members of FSB OC board on Northern Caucasus:operating coordinative board.Its central base is in Pyatigorsk town). All of them is big and husky and being in full equipment. They treated locals aggressively.The third auto of the capture group was silvery auto «devyatka»,without licence number plates,with darkened glasses. There were members of radio homing section of FSB board on Ingushetiya in the third car – they looked after Ozdoev’s auto by his mobile phone.Having perceived shadowing,Rashid phoned his colleague senior assistant procurator of Kabardino-Balkariya,Zaida Kodzoeva- several times and urgently asked her on no account to switch her mobile phone off because he would call her. But Rashid has not called; his mobile phone appeared to be switched off and he himself was missing. His kidnapping happened after he had sent a procuracy presentation of RI FSB board’s participation in people traceless disappearances in Ingushetiya, for RF general procurator office.